View of Calbrook in the Isle of Wight. 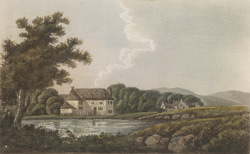 Unfortunately neither the house in this print nor the location can be identified. The Isle of Wight is situated in the English Channel and is 22.5 miles long and 13.5 miles wide. It was once joined to mainland England by a chalk ridge. The climate on the island is often warmer than the mainland and this has made it popular with tourists for over 200 years. This is a typical example of an item from the King George III Topographical Collection. The King was fascinated with the landscape and geography of Britain and collected maps, atlases and prints as well as original watercolour drawings of various locations around the British Isles.